The 3rd Carpathian Rifle Division (Polish : 3 Dywizja Strzelców Karpackich, sometimes translated as 3rd Carpathian Infantry Division), also commonly known as Christmas Tree Division due to the characteristic emblem, was an infantry division of the Polish Armed Forces in the West that fought during World War II on the Italian Front. It was formed in 1942 of the Polish Independent Carpathian Brigade and the forces of Lieutenant-General Władysław Anders' Polish 2nd Corps evacuated from the Soviet Union. A division is a large military unit or formation, usually consisting of between 10,000 and 20,000 soldiers. Infantry divisions during the World Wars ranged between 8,000 and 30,000 in nominal strength. Plaque at Polish camp, Hodge Moore. The division participated in the North African and the Italian Campaigns (1941–1945) as part of the British Eighth Army. 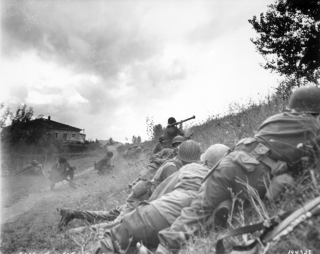 Notable actions in Italy include the victories in the Battle of Monte Cassino, Ancona and Bologna. Disbanded after the war, most soldiers chose not to return to the new, Communist Poland. After the war, the division was housed at Hodgemoor Camp in Hodgemoor Woods, Chalfont St Giles, Buckinghamshire, England. They maintained a presence there until 1962. There were, and may still be, many Polish families in the area. The North African Campaign of the Second World War took place in North Africa from 10 June 1940 to 13 May 1943. It included campaigns fought in the Libyan and Egyptian deserts and in Morocco and Algeria, as well as Tunisia. The Eighth Army was a field army formation of the British Army during the Second World War, fighting in the North African and Italian campaigns. Units came from Australia, British India, Canada, Free French Forces, Greece, New Zealand, Poland, Rhodesia, South Africa and the United Kingdom. The Battle of Monte Cassino was a costly series of four assaults by the Allies against the Winter Line in Italy held by Axis forces during the Italian Campaign of World War II. The intention was a breakthrough to Rome. General Stanisław Kopański was a Polish military commander, politician, diplomat, an engineer and one of the best-educated Polish officers of the time, serving with distinction during World War II. He is best known as the creator and commander of the Polish Independent Carpathian Brigade and Polish 3rd Carpathian Infantry Division. In modern use, the order of battle of an armed force participating in a military operation or campaign shows the hierarchical organization, command structure, strength, disposition of personnel, and equipment of units and formations of the armed force. Various abbreviations are in use, including OOB, O/B, or OB, while ORBAT remains the most common in the United Kingdom. An order of battle should be distinguished from a table of organisation, which is the intended composition of a given unit or formation according to the military doctrine of its armed force. As combat operations develop during a campaign, orders of battle may be revised and altered in response to the military needs and challenges. Also the known details of an order of battle may change during the course of executing the commanders' after action reports and/or other accounting methods as combat assessment is conducted. The II Corps was a corps-sized formation of the United States Army that was active in both World War I and World War II. It was originally formed and fought on the Western Front during World War I and was also the first American formation of any size to see combat in North Africa or Europe during World War II. The Polish II Corps, 1943–1947, was a major tactical and operational unit of the Polish Armed Forces in the West during World War II. 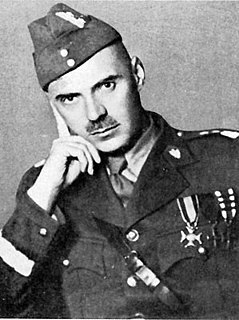 It was commanded by Lieutenant General Władysław Anders and fought with distinction in the Italian Campaign, in particular at the Battle of Monte Cassino. By the end of 1945, the corps had grown to well over 100,000 soldiers. The Polish First Army was a communist Polish Army unit formed in the Soviet Union in 1944, from the previously existing soviet Polish I Corps as part of the People's Army of Poland (LWP), a formation of the Polish Armed Forces in the East. The First Army fought westward, subordinated to the Soviet 1st Belorussian Front, during the offensive against Germany that led to the liberation of Warsaw in January 1945, and the capture of Berlin in May 1945. Polish Independent Carpathian Brigade was a Polish military unit formed in 1940 in French Syria composed of the Polish soldiers exiled after the invasion of Poland in 1939 as part of the Polish Army in France. It was commanded by General Stanisław Kopański. Bolesław Bronisław Duch (1885–1980) was a Polish Major General and General Inspector of the Armed Forces. The 6th Armoured Division was an armoured division of the British Army, created in September 1940 during the Second World War. The unit was initially supplied with Matilda and Valentine tanks, which were replaced by Crusader tanks and then finally with the M4 Sherman tank. The division participated in the Operation Torch assault landings in Algeria and Morocco in November 1942 and saw its first action as part of V Corps of the British First Army in the Tunisia Campaign. After Tunisia, it participated in the Italian Campaign as part of the British Eighth Army and ended the war in Austria, again under the command of V Corps. Polish Armed Forces in the East refers to Polish military forces established in the Soviet Union during World War II. The Italian Co-belligerent Army, Army of the South, or Italian Liberation Corps were names applied to various division sets of the now former Royal Italian Army during the period when it fought on the side of the Allies during World War II from September 1943 onwards. During the same period, the pro-allied Italian Royal Navy and Italian Royal Air Force were known as the Italian Co-belligerent Navy and Italian Co-belligerent Air Force respectively. From September 1943, pro-Axis Italian forces became the National Republican Army of the newly formed Italian Social Republic. Polish 3rd Legions Infantry Division was a tactical unit of the Polish Army between the World Wars. Formed in 1919, as a third unit composed significantly of veterans of the Polish Legions in World War I, it saw extensive action during the Polish-Bolshevik War and the Invasion of Poland. In the interbellum period, the headquarters of the division was stationed in Zamość, while its regiments were garrisoned in Chelm, Lublin, Zamosc and other locations. The 11th Carpathian Infantry Division, was a tactical unit of the Polish Army in the interbellum period, which fought in the Invasion of Poland in 1939. Elements of the unit would go on to serve in the Polish Armed Forces in the East. The National Republican Army was the army of the Italian Social Republic from 1943 to 1945 that fought on the side of Nazi Germany during World War II. The Battle of Bologna was fought in Bologna, Italy from 9–21 April 1945 during the Second World War, as part of the Spring 1945 offensive in Italy. The Allied forces were victorious, with the Polish II Corps and supporting Allied units capturing the city on 21 April. The Polish 5th Kresowa Infantry Division was an infantry division of the Polish Armed Forces in the West during World War II. Formed in March 1943, it fought in the Italian Campaign as part of Lieutenant General Władysław Anders' Polish II Corps, affiliated with the Western Allies, under command of the British Eighth Army. The First Canadian Army was a field army and the senior formation of the Canadian Army that served on the Western Front from July 1944 until May 1945 during the Second World War. The 276th Rifle Division was an infantry division of the Soviet Union's Red Army during World War II, formed twice. The 271st Rifle Division was an infantry division of the Soviet Union's Red Army during World War II.